Pro: You can see all defending Pokémon at once. No longer do you need to swipe through up to 10 different Pokémon to see who’s the gym leader. Instead, simply tapping on a gym will display all of the defending Pokémon at once. Not only that, but in standard GPS view, gyms have more distinct looks depending on how many Pokémon are occupying that location, as opposed to trying to gauge tower height. Defending Pokémon now visibly roll as a crew, posing together as if awaiting a photo op. This bolsters the appeal of themed gyms (for example, all Eevee evolutions) too. 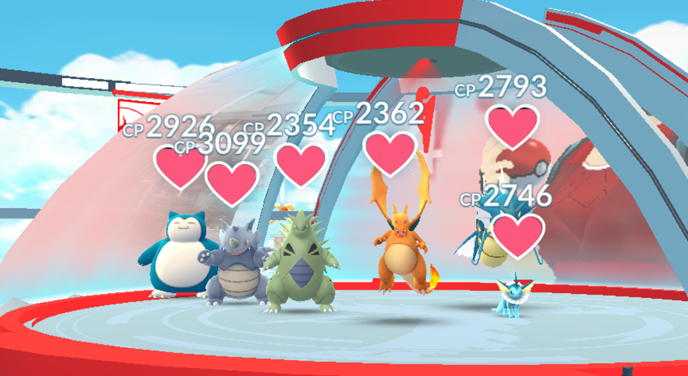 While it’s cool to see all the defending Pokémon grouped together on a gym, the game will often place Pokémon on top or in front of one another, making it finicky to browse through them. With all of the defending Pokémon on display together, you don’t get trainer info or Pokémon names unless you tap on an individual character, and even when you do, those elements are represented with less prominence than before. So, players who spent a lot of time renaming Pokémon or buying custom apparel for their trainer avatar may feel a bit shortchanged for their efforts. Players can now simply walk up to any gym with openings for their team and add a Pokémon to the posse. Pre-update players would have had to “train” at the gym by fighting their own team’s pokémon to increase the gym’s prestige to the point where a new slot was available, costing health items and taking quite a bit of time. While many gyms will still host an array of “top tier” Pokémon, the new restriction against duplicate Pokémon at least keeps teams from posting a whole army of Blisseys that take forever to grind through. Beyond that, the new Pokécoin system (detailed in a later entry) actually encourages players to post Pokémon that might not be the strongest in their arsenal, meaning gyms are often occupied by monsters you’d never see there before the update. The ease of joining a gym means that slots fill faster. Couple that with the fact that only 6 Pokémon can occupy a gym instead of 10, and you’ve got a land rush every time a gym switches allegiances. Say what you will about the “training” system, but at least it felt like you could work your way into a spot instead of waiting for the next round. With the removal of “training” at gyms, so goes any hope of earning a golden badge for doing so (unless you had the foresight to complete the task pre-update, in which case, well aren’t you special). Even worse, the badge still hangs around your trainer stats page as an infuriating loose end that can never be fulfilled. With Motivation, Pokémon at gyms now have a constantly depleting heart meter that decreases their CP level and thus makes them easier to defeat in battle. As a result, there ends up being more gym turnover than before. As a result, the game is much more dynamic than when an area was just a string of powerful level 10 towers that no one wanted to bother challenging. Players can refill heart meters by feeding Pokémon berries. This means that even if you aren’t actively defending your team’s gym with a monster from your stable, you can still contribute and earn gym badge level points. The pink banana-looking berries could always be fed to Pokémon to make them sit still while trying to catch them, but once you’ve been playing the game long enough, decent aim negates their practical use. Post-update however, players can feed these useless berries to defending pokémon and they refill heart meters just as well as their counterparts. Thanks to Motivation’s perpetual drain on CP, even very powerful Pokémon will be deflated to conquerable levels for less experienced players, given enough time. And the higher the CP of the Pokémon, the faster their Motivation falls. You can’t rest on your laurels, er gym ownership, anymore. If you want to hold a gym for more than a day, you’d better return to it regularly and feed your Pokémon berries to keep their CP up. Each time you win a battle against a gym defender, you will decrease that Pokémon’s Motivation by 1/3. It goes without saying that if you can defeat that Pokémon at full Motivation, you can defeat them at a fraction of that power. Thus, subsequent battles against the same defenders are totally superfluous. Turnover is heavily prioritized at gyms, so the notion that you can just plant on your favorite spot and hold it indefinitely is long gone. If your gym is under attack, there is little you can do to stem the tide. While it’s true that you can feed weary Pokémon berries, you’ll run out way before attackers give up the assault. The math is overwhelmingly against you; better to let them win, and retake the gym later. Because it’s easier to join a gym, it’s also easier to earn Pokécoins for your efforts. Simply find a gym with an opening and start raking in the dough, no matter your level. Earning Pokécoins has shifted from being awarded once a day based on the number of gyms you’re defending to a system where coins accumulate at a rate of 1 per 10 minutes per defending pokémon. So, previously you’d have to hold down 5 gyms at once to get 50 coins, but now you need only have one Pokémon hold its spot for 8.5 hours to acquire the same amount. This one’s pretty straightforward. You can only make half as much money in one day than you used to. You can station Pokémon on 20 gyms at once now instead of 10, but what does it matter when so many of your pokémon are so likely to come back empty-handed because you’ve already reached the daily limit? You earn coins based on time defended but do not receive those coins until Pokémon are returned to you, which strangely incentivizes players to allow their Pokémon to weaken and lose so they can bank coins. If you find a gym that is rarely challenged, you might hold it for days, but you’ll only earn 50 coins for your efforts, or fewer if you’ve already earned some of your allotted 50 coins per 24 hours. With this update Pokémon GO’s meta has shifted from holding gyms to strategically staggering defeats. These battles where trainers from all teams come together to defeat rare monsters feel like Pokémon GO’s purest manifestation yet of the spirit of Pokémon as a social experience. Rather than slogging away on buddy candy in pursuit of an evolution, now you have the option of getting friends together to defeat Tyranitar, Snorlax, and other powerful monsters as a group and earn a chance to catch one for yourself. It’s likely that the fabled legendary Pokémon will be released in some form of raid battle in the near future. While you have to choose your daily raid battle wisely (you only get one unless you pay up), raid bosses are on a rotation, so you could find one you missed again if you keep your eyes peeled. With the frequency of raids, there can also be a decrease in player interest due to lack of urgency. Each raid boss has a power ranking and only the lowest level are possible to defeat solo. If you want to take down a level 2 or 3 raid boss, you need help, but might have a hard time finding it. Low population centers have been a problem for Pokémon GO since day 1, and raids further exacerbate this deficiency. Players in rural areas may find themselves hopelessly underpowered for many raids just based on the low number of players in their area. Hopefully if Niantic does release legendary Pokémon via raids, they’ll turn it into a prominent event and draw players a few centralized locations at specific times. More than ever it pays to play Pokémon GO with friends, but even for solo players the new Motivation system encourages players to support one another directly. No more stagnant gyms towers. Thanks to the high rate of gym turnover, the game actually feels alive again in a way it hasn’t for months. 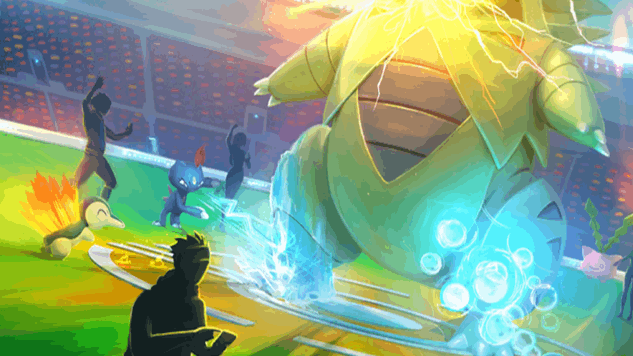 Like an MMO, the addition of raids gives high-level players an endgame point of focus, and opens the door for lower level players to engage with gyms in ways that they were cut off from before. Pokémon GO has never been a stranger to technical issues, but each new system in the update brings its own set of problems, from delayed reactions in battles to the fact that you can’t check the status of gyms where you’ve completed a raid until the event is over (whenever that is; the timer also goes away). All too often players need to look outside of the game itself and even official Niantic channels to learn basic information about how Pokémon GO works. Nowhere in the game does it say that you can only earn 50 coins per day, how often you earn coins, or even how to throw a curveball. Special events begin without an announcement, if one comes at all. There’s a whole cottage industry around explaining the basics of how to play Pokémon GO that Niantic should really be handling in-house. Sure, raid battles are nice, but we’re already waiting on trading and real time player vs player battles, both of which are core to what Pokémon is. Perhaps these modes are still on the way, but one wonders if Niantic will still hold the interest of fans once Nintendo publishes their own Pokémon game for Switch, which us rumored for release next year. Dan Solberg is a digital artist, writer, and professor, producing works about videogames, music and art. You can check out more of his work on his website, dansolberg.com, and see his not-work by following him on Twitter.